While the 1981 study by Harry W. Greene and Roy W. McDiarmid published in “Science” firmly established that some species -- including milk snakes -- mimic venomous coral snakes, their colors may confer several other benefits as well. In addition to serving a mimetic purpose, the color patterns of milk snakes may provide a strong visual reminder of their potent musk, serve a cryptic purpose in the dark or provide other unrecognized advantages. Found throughout much of North and Central America, milk snakes (Lampropeltis triangulum ssp.) have one of the largest ranges of any snake species in the world. Several different subspecies exist throughout this range, and each has adapted to its local ecosystem. Most milk snake subspecies attain a length of 2 or 3 feet, though some Central American forms -- such as black (L. t. gaigeae) and Honduran milk snakes (L. t. hondourensis) -- may exceed 6 feet in length. Milk snakes are non-venomous constrictors that prey on lizards, rodents and other snakes. Milk snakes are oviparous, and deposit eggs annually in a log, rodent burrow or other secluded place. The overwhelming majority of milk snake subspecies have a color pattern that closely matches local coral snakes (Mircurus sp.). This phenomenon -- termed Batesian mimicry -- allows the harmless milk snakes to masquerade as highly venomous coral snakes. 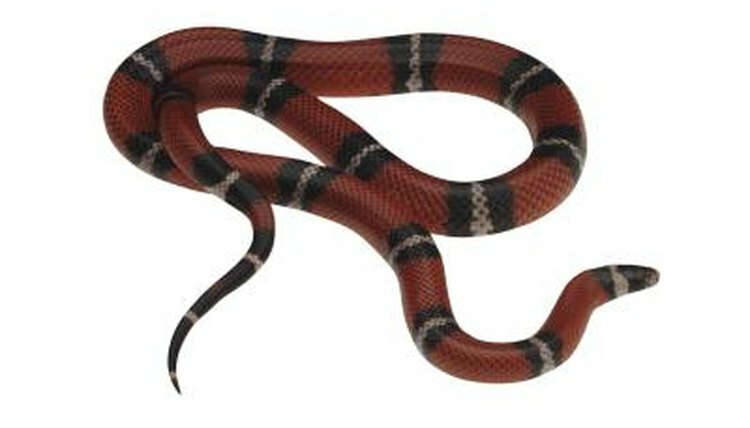 In 2009, researchers R. Alexander Pyron and F. T. Burbink studied the prevalence of coral snake mimicry throughout the clade which includes milk snakes. Publishing their results in the “Journal of Evolutionary Biology,” the scientists found that mimicry coloration was largely restricted to lizard-eating species that grow to lengths of 2 or 3 feet; presumably, snakes that are too large to be mistaken for coral snakes do not benefit from mimicking them. Black milk snakes demonstrate one novel solution to this problem. Inhabiting the high elevations of Costa Rica and Panama, black milk snakes eventually exceed the length of coral snakes. While hatchling black milk snakes are brightly ringed with red, white and black to match the local coral snakes, as they age, they become darker, and eventually become completely black. Like all snakes, milk snakes have two musk glands located at the base of their tail. When attacked by a predator, milk snakes will discharge the foul-smelling liquid and defecate -- the noxious odors created repel some predators. Because of their bright color pattern, predators may remember prior experiences, and avoid milk snakes in the future. It is possible that the color pattern of milk snakes helps them in more than one way. While their bold yellow or white and red colors are plainly obvious during the day, they may perform a cryptic function after dark or to color-blind predators. This is consistent with the nocturnal activity cycle of most subspecies. Science; Coral Snake Mimicry: Does It Occur? What Snakes Can Eat Rattlesnakes?